Prehistoric Gardens in Oregon's Rain Forest is located on then Southern Oregon Coast Hwy 101, halfway between Port Orford and Gold Beach. Interesting tourist attractions displays life-size replicas of dinosaurs and other prehistoric animals. 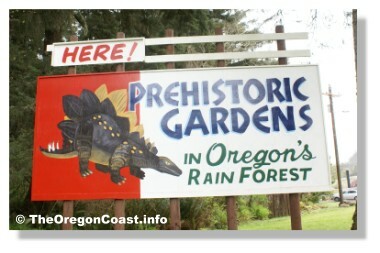 Enjoy this Prehistoric Gardens created by Oregon sculptor, Ernest V. Nelson.